Any mention of Christmas in November can be met with horror and revulsion because it’s considered to be ‘too soon’. There is some truth in that, with shops cluttered with decorations before the temperature outside has even turned cold. Now that we’re officially in December, however, we are at absolute pleasure to spend 25 whole days to think about Christmas, with its good will, wishlists and partywear. Whether you’re religious or not, this is an extremely joyous and exciting time of the year, where we can really let our hair down, spend some quality time with our friends and family and indulge in the best foods and drinks. The A/W 2015 runways were full of looks that are perfect for the season, with embellishments, bright colours and dramatic silhouettes that are sure to turn heads at festive soirees. In honour of this New York-based blog, we’ve looked at three pieces from famous designers hailing from the city that never sleeps for sartorial inspiration. Of course, many of us cannot afford the gastronomical prices that designer clothing can run up to, but if we can’t dream at Christmas, when can we? Everyone needs a warm coat to throw over their party dress to shield us from the elements and to add a little something special to our ensemble. For something luxurious, avant-garde but still totally tasteful, we’d definitely opt for Michael Kors’ knee-length long-haired fur coat. In a rich teal hue, the coat, for all of its extravagance, remains understated and sophisticated, adding a delightful layer of warmth and comfort, but also a splash of refined colour to your look. The coat can be worn over any number of looks for evening: we might opt to contrast its voluminous shape with a close-fitting bodycon dress (shop at MaryJane Fashion), or a sleek pair of tapered trousers and a sparkling turtleneck top for a little added sparkle. This coat is a fantastic investment piece, and will be a coat that you return to season after season. Surely that makes it worth splashing thousands of dollars on? Timelessly elegant, Diane von Furstenberg has long been a go-to for powerful, feminine women thanks to her effortlessly flattering designs. Her appeal has extended to a whole new generation thanks to Instamodels like Jourdan Dunn, Kendall Jenner, Malaika Firth and Gigi Hadid who frequently appear on her runways. This season, her eveningwear was sultry and luxurious, incorporating slim lines, lace panels, camisole cuts and hues of red, black and blue. We love this longline black dress that features to strips of lace at the stomach: it plays peek-a-boo without revealing too much too soon, creating a look that is demure but reveals an element of feistiness. We also love the polka dot sheer tights that von Furstenberg ran throughout her entire collection, which added an element of elegant whimsy to all of her looks. Carolina Herrara has a reputation for producing sumptuous eveningwear, counting A-list stars like Renée Zellwegger, Anna Wintour, Tina Fey and Dianna Agron as red carpet fans. This A/W 2015 she produced a collection that was ridiculously cool and contemporary, whilst still incorporating some of her favoured full skirts and breezy fabrics. Most covetable, however, were her selection of cocoon-shaped jumpers and coats: this silhouette is, in my humble opinion, completely underrated, because it helps to skim over curves to create a look that is at once flattering but also modern and slightly unorthodox. 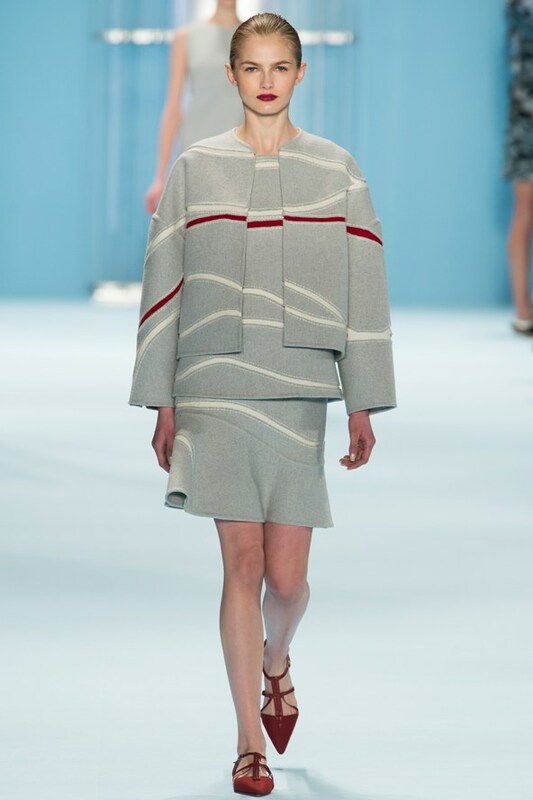 Herrera teamed this heavy cocoon-shaped grey coat with waving strands of cream and red running across the front and back with a matching grey under-layer and a matching fit-and-flair skirt. Never has a co-ordinating, matchy-matchy look seemed so appealing and stylish. Paired with a pair of ruby red pointed flats, this ensemble is a statement look without all the loud noise, just oodles of sophistication and style.